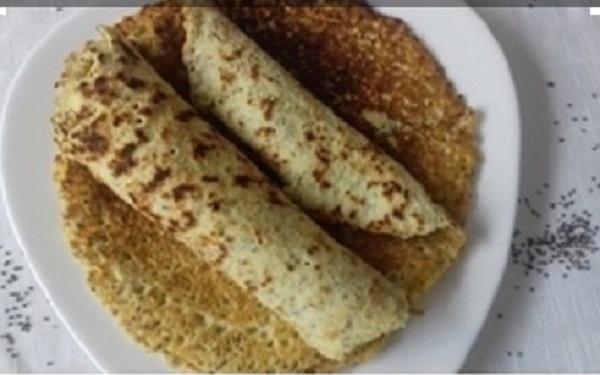 These are amazing healthy chia seeds crepes, with coconut flour and chia seeds. Perfect for breakfast, but also and perfect as a snack. It is your choice how you will eat them. They can be a nice salty wrap or sweet pancakes. They are Paleo, Low-Carb, Gluten-Free, Sugar-Free, Grain-Free, Nut-Free, and Dairy-Free. In a large bowl, whisk all ingredients together until smooth. Let the batter sit for 10 minutes to account for the natural thickening caused by coconut flour and chia seeds. The batter should be very runny right before cooking – it should pour easily. If it is necessary you can add a few more tablespoon of coconut milk. Pour 1/4 cup of batter into the skillet and immediately tilt in different directions to evenly distribute. Cook, until the edges, are golden and you see bubbles forming in the middle. Flip over, and cook until browned on the other side (1-2 more minutes).